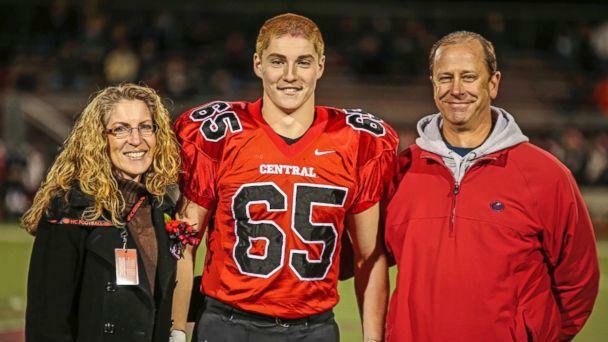 The state-of-the-art surveillance cameras at Pennsylvania State University's Beta Theta Pi fraternity house that captured much of what happened to pledge Timothy Piazza before he died will "unquestionably ... become important evidence" in the cases against fraternity members charged in connection with Piazza's death, said ABC News Chief Legal Analyst Dan Abrams. Piazza, a 19-year-old sophomore and pledge at Penn State's Beta Theta Pi fraternity, died on Feb. 4, after he fell down the stairs during a pledge ceremony at the house on the night of Feb. 2. Fraternity members did not call 911 until the morning of Feb. 3, about 12 hours after Piazza's fall, according to a report on the grand jury's investigation. Piazza's death "was the direct result of traumatic brain injuries," according to the forensic pathologist. 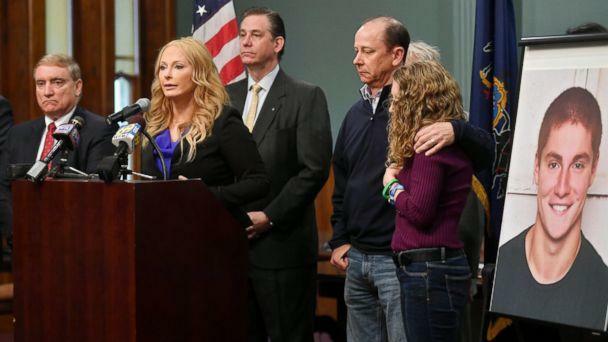 The eight or nine full-color and full-broadcast-quality cameras at Beta Theta Pi showed that Piazza’s skin had turned gray by the morning of the 911 call, Centre County District Attorney Stacy Parks Miller told ABC News. The color change was especially noticeable in the final 40 minutes before the 911 call -- the time period prosecutors call the "cover-up" -- during which the students allegedly wanted to make Piazza appear healthier than he was by trying to dress him in clean clothes, Parks Miller said. Abrams said today on "Good Morning America," "The fact there were these surveillance cameras with these very well-defined pictures is unquestionably going to become important evidence in the context of this case. Because it may be able to show exactly what happened, who was where when, the sorts of things that you typically will need eyewitnesses or other evidence to say, 'Wait, I wasn't there,' 'I was there.' If a lot of this is on camera, those questions go away." 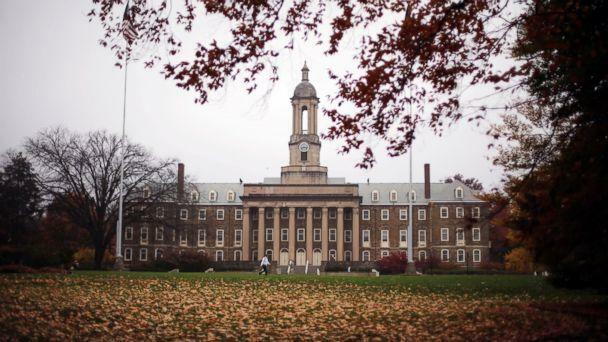 Eighteen Penn State students are facing charges: eight for involuntary manslaughter, aggravated assault, reckless endangerment and hazing, among other charges; four for reckless endangerment and hazing, among other charges; and six for evidence tampering. The Beta Theta Pi fraternity -- which has since been barred from Penn State -- is facing charges including involuntary manslaughter and hazing. Abrams said, "It's really important that we look at these cases individually and not just sort of lump everyone in together." "It's going to be a prosecution against each one individually," Abrams said. "Each one of them, of course, will have their own attorney defending in their own way. "When you're talking about involuntarily manslaughter," Abrams added, "which is the big charge against eight of them, you don't have to have shown someone tried to do it, or someone did it on purpose. The question is what was their conduct that led up to it, not what happened after the fact." The surveillance cameras at Beta Theta Pi documented much of the interactions between fraternity members and Piazza in the 12 hours between the fall and the 911 call. Here is how the night of Feb. 2 and early morning hours of Feb. 3 unfolded at the fraternity house, according to the grand jury report, which cited evidence including surveillance video, testimony and phone records. While the fall was not caught on video, video at 10:47 p.m. showed Piazza being carried upstairs by four fraternity brothers; in the video, his body appeared limp, his eyes were closed, he appeared unconscious, and a bruise was visible on his side. Piazza was placed on a couch, and liquid was dumped on his face twice, but he didn't respond either time. About a half an hour after the fall, at 11:14 p.m., a newly initiated member saw Piazza lying on the couch, looking "horrible," he later told the grand jury. He saw Piazza "thrashing and making weird movements on the couch" and screamed at the fraternity brothers for help, stressing that Piazza needed to go to the hospital because he could have a concussion. One brother shoved the newly initiated member into a wall and said they had it under control. At 11:25 p.m., the pledge master slapped Piazza three times in the face. At 11:37 p.m., one fraternity brother tackled another brother into the couch, physically landing on top of Piazza. By 1 a.m., some brothers saw Piazza vomit and twitch on the couch. Three brothers filled a backpack with books and placed it on Piazza to try to keep him from rolling to his back if he passed out. At 1:48 a.m., Piazza rolled off the couch and to the floor, and three brothers picked him up and "slammed him onto the couch." One brother hit Piazza hard once in the abdomen. By 2:38 a.m., Piazza rolled to the floor and at 3:16 p.m. his legs were moving. At 3:22 p.m., Piazza tried to stand and the backpack came off and he fell back, hitting his head on the hardwood floor. A fraternity brother attempted to shake him for a moment and then left the room. At 3:46 a.m., Piazza was curled up on the floor in the fetal position with his knees toward his chest. At 3:49 a.m., Piazza positioned himself on his knees, bent over with his elbows on the floor and his head in his hands. At 3:54 a.m., he tried to stand but fell face down on the floor. At 4:59 a.m., he stood and then fell head first into an iron railing, landing on a stone floor. "He gets up again and attempts to go to the front door, but before he reaches it he falls head first into the door," the grand jury report says. He later rolled to his side, clutching his abdomen. At 5:15 a.m., one brother came into the room, stepped over the injured pledge, looked at him and then left the room. At 5:26 a.m., another brother saw Piazza on the floor and walked him to another room but Piazza fell down three steps, and the brother stepped over him on the floor and left him there. At about 10 a.m., fraternity members found the 19-year-old in the basement lying on his back, breathing heavily and with blood on his face. One brother said Piazza's eyes were half open and he felt cold. Three men carried Piazza's unconscious body upstairs and placed him back on the couch. Surveillance footage showed brothers shaking him and trying to prop him up. At 10:48 a.m., a fraternity member called 911 but did not say Piazza fell down the stairs the night before. The grand jury concluded that after Piazza was taken to the hospital there was an active attempt to conceal evidence of the hazing and underage drinking, from deleting messages to admitting to discussing erasing surveillance video. In a deleted text that was recovered, one man wrote, "If need be, just tell them what I told you guys, found him behind [a bar] the next morning at around 10 a.m., and he was freezing-cold, but we decided to call 911 instantly, because the kid's health was paramount." The grand jury found evidence of a history of hazing at the fraternity that included forced drinking and paddling, and found that Penn State's Greek community "nurtured an environment so permissive of excessive drinking and hazing that it emboldened its members to repeatedly act with reckless disregard to human life." The grand jury concluded that Piazza's death wasn't the result of isolated conduct or a simple mistake but as a "direct result of the extremely reckless conduct of members of the Beta Fraternity who operated within the permissive atmosphere fostered" by Penn State's Interfraternity Council. All defendants have been preliminary arraigned but none have entered pleas. “The facts of this case are troubling and tragic and we’ll do everything we can to defend this charge,” he said. “I empathize with the family of the deceased, I empathize with the family of those who are charged. “My client has -- and this is not to be misinterpreted as acceptance of responsibility or admitting culpability -- my client has tremendous human compassion and empathy for the family of the deceased, for the deceased himself. This was an unspeakable tragedy,” Brennan added. “Having said that, it is my position that there is no criminality on the part of my client. “It’s heartbreaking. If this case doesn’t draw emotion and tug on your heart strings or bring a tear to your eye, you’re inhuman,” he said. “I commend the DA office in the pragmatic way that they handled the charging process here because hundreds of people were at the frat house. Piazza family attorney Tom Kline called the surveillance video "gruesome" and said it showed "conduct which is reprehensible. Beyond human decency." Kline called this the "worst possible debauchery and depravity that you could possibly have anywhere, let alone a college campus." Kline said the Piazza family is "committed to full justice. The Piazzas are committed not only to punishment but to deterrence. They want to make sure that this never happens again at Penn State or at any American college campus." Penn State President Eric Barron in a statement Friday said, "The alleged details in the grand jury presentment, which suggest the inhumane treatment of a student forced through hazing to consume dangerous amounts of alcohol and endure hours of suffering, are sickening and difficult to understand." "It should go without saying that hazing and dangerous drinking are not permitted by the University, and the University takes appropriate action to educate its students about these issues and to hold them accountable whenever it learns of such wrongdoing," Barron said. Beta Theta Pi International Fraternity said in a statement, "The nature of those charges are incredibly disheartening as the organization and its membership continue to grieve Tim’s passing and the pain experienced by his family." Beta Theta Pi said that since Piazza's death "the International Fraternity has cooperated fully with local officials in their investigation. The early findings of that investigation indicated that the behavior of several undergraduate members was in direct contradiction of the International Fraternity’s expectations and risk management policies, as well as the International Fraternity’s reputation and commitment to character development." "Beta Theta Pi International Fraternity has clearly and consistently expressed its position that it does not tolerate hazing or alcohol abuse in any form by its members. The former undergraduate members were well educated by the International Fraternity and Penn State on these policies; however, they are entitled to the presumption of innocence as they face these charges," the statement said. "The International Fraternity stands by its decision to suspend and disband the former chapter on February 17, 2017. The International Fraternity’s policy that prohibited alcohol in the Penn State chapter house, along with the extensive annual investment in risk management, leadership and character-development programs that teach young men the importance of integrity and caring for others, underscored the International Fraternity’s expectations of all of its members." In a statement, the Penn State Interfraternity Council said its focus is "leading the change Penn State needs to prevent a senseless tragedy like this from happening in the future." "We are committed to addressing the critical issues in our fraternity community head on," the statement said. "We have formed stakeholder working groups tasked with developing increased community standards and enhancing student safety. The best way to shift culture is for students, alumni and the university to work together."